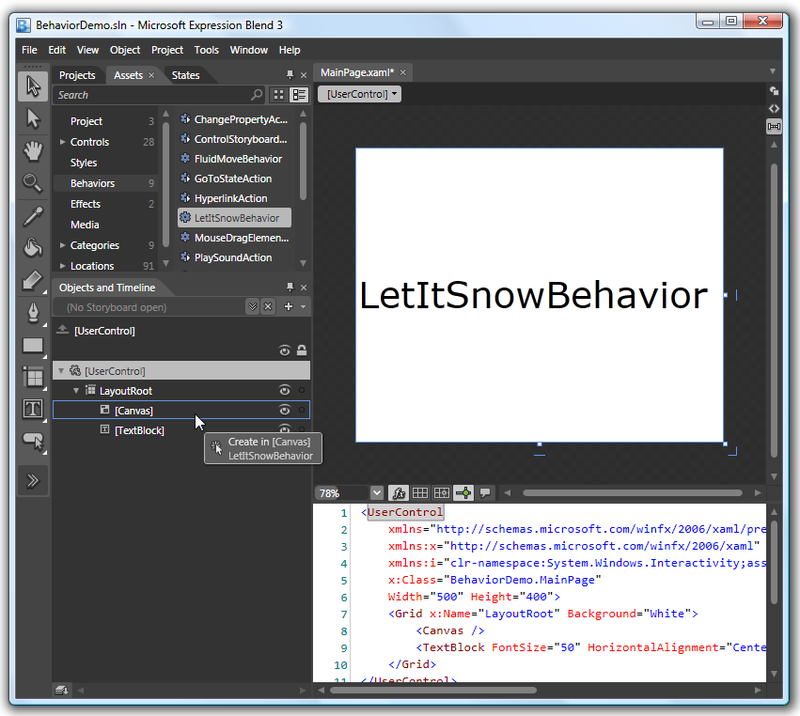 To add the LetITSnow Behavior to your own application you first have to reference the 'ReflectionIT.Behavior.dll'. Then you can apply the LetItSnowBehavior from Expression Blend 3.0 by dragging it from the Asset Tab onto an empty Canvas. That's all. The Canvas will now have a Interaction.Behaviors element with the LetItSnowBehavior in it. The LetItSnowBehavior was created using the Behavior 'Add New Item...' template from Blend 3.0. The overriden OnAttached method generates the SnowFlakes. The SnowFlake is an Image with a random size, speed and opacity. The position is updated every 10 milliseconds using a DispatcherTimer.